George Barna sets the stage in the foreward by giving his diagnosis of a problem: ecclesia exitus. This, he explains, is "the Latin term for church dropout" (ix). 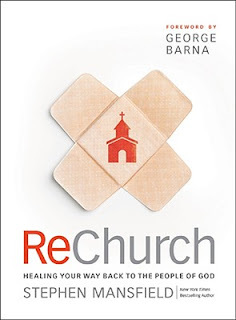 Then Barna cites a staggering statistic: "[N]early four out of every ten unchurched people (37 percent) in the United States avoid church because of bad experiences in a church or in relation to church people" (xii). Stephen Mansfield is the founder of The Mansfield Group, and author of several books, inlcuding The Search for God and Guinness, The Faith and Values of Sarah Palin, The Faith of Barack Obama, and The Faith of George W. Bush. In this book, Mansfield sets out to bring such people back to church. The matter for Mansfield isn't just public, it's also personal. He says, "[S]ome of the most gifted and potentially powerful I know are right now at a Starbucks or at a bar somewhere griping about the church, too tainted by grief and bitterness to be any use to anyone" (12). In recent years, books like Dan Kimball's They Like Jesus but Not the Church and documentaries like Lord, Save Us from Your Followers have given visibility to (while not endorsing) the notion that God can be spliced from his people and "everything's cool" as long as "Jesus is my Homeboy." However, Mansfield inisists, "To think that we are entitled to love God and hate his people is sin" (15). Diving in, he pins the problem (at least in these cases) on our forgetfulness of human nature. "In our sentimentality about our church and those we love in it, we forget to stand guard against the natural failings of humanity" (45). Contrasting physical pain and emotional pain, he explains, "If we sit on a sharp object, the pain stops when jump up. When we are hurt emotionally, though, we carry the torment with us as we go" (66). That point is essentially the thrust of a talk - "Death by Paper Cuts" - that Rob Bell delivered recently at his "Poets, Prophets, Preachers" seminar. Moving forward, Mansfield walks the reader through a process for forgiving the person(s) who caused the hurt. That process begins with identifying the positives and expressing gratitude for those things (107). This is as simple as "counting your blessings." His view about the origin of all-things negative, however, teeters and totters between God's ordained plan and Satan's strategically placed traps. Maybe he is able to hold those two conflicting concepts together, but it's certainly an issue that deserves further clarifcation (especially because he builds much of his case on God's having predestined the hurtful events in question for some "greater" purpose). If you're moved enough to head back to church, Mansfield offers this advice: "Don't make your choice based on the Wow Factor or the Entertainment Factor or matters of personal charm and style. Choose instead after having listened and experienced for a while, based on whether or not the leadership team of this church will be able to coach you to your destiny and toward your place in the body of Christ" (153). 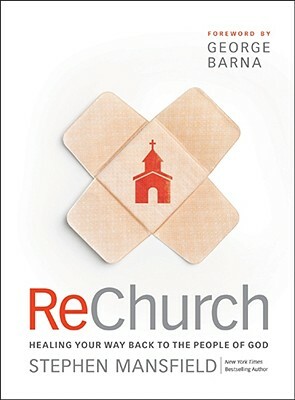 This book is basically an exposition of the process of forgiveness and restoration, which is then applied to a person's stance toward the church. It offers worthwhile insights if you currently find yourself in a broken and bitter state of mind, or consider yourself "burned" by the church. You won't find all your answers in this work (it's only 192 short pages), but it can at least get you moving in a better direction.